Cars and trucks have long been one of the manufacturing anchors and job sources of the United States economy since the birth of the model T and because of advancements in technology; the industry has truly gone global. One innovative American digital business of note is Cars.com which launched in 1998 out of Chicago and has since become a property of Gannett Company spinning off in May, 2017 as a new, publicly traded company on the NYSE named Tegna, Inc. The website has a robust database of new and used cars for sale nationwide loaded with tips and tools for automobile owners and would be buyers. The Sports Techie community blog readers and followers can review the American-Made Index which has been revamped for this year to include more criteria via the AMI link below. Read on if you or a family member, friend or work colleague are in the market to buy, lease, sell, or trade, a new or used car. Jeep Wrangler, Wrangler Unlimited (Toledo, Ohio) earned the top of AMI 2017. The American-Made Index has become a standard for domestic car manufacturer reviews. Viewers can peruse assembly location, domestic-parts content, engine sourcing, transmission sourcing and U.S. manufacturing jobs supported by per vehicle. This research based index focuses on how each manufacturer affects our economy regardless of where their HQ is located. What began with 60 cars shrunk down to 8 last year and as a result, new data was introduced since only 3 2017 models would have made the list this year with the old requirements. Thus the new AMI was born. The deep dive analysis of U.S. cars built with a high-domestic part ratio is still a prominent data point along with American sourced engines and transmissions as well as the amount of jobs for workers in the states created per auto. What was given less weight is the overall sales to determine model line impacts, rather more weight was given to how our economy was affected by each single buyer per model compared to another. In total, five additional components went into the new index ranking. You would have to be off the grid to know that President Trump campaigned under an ‘American First’ motto. Therefore it is no surprise that consumers are more interested than ever in knowing where cars are built. A Cars.com June, 2017 survey of 1,023 participants uncovered that approximately 25 percent of buyers would only buy from American-made companies which double the 2016 responses. About 25 percent last year also shared their personal knowledge about where what amount of cars they thought sold in the U.S. where made here and it came out to around 31% to 40%. Considering only cars produced by manufacturers with headquarters in America such as Ford, GM and Tesla, who made up one third of all U.S. sales through May according to Automotive News, it appears to be true to consumers. Yet when factoring in non-American HQs to the bottom line it soars to 60 percent says Cars.com in a January analysis. To further the point, it appears that 3 of 5 light-duty vehicle sales in 2016 were assembled here in the United States. The expert team at Cars.com gathered and crunched figures on 120 light-duty passenger vehicles built within our borders to come up with a top 10. All information pertains to the 2017 model year. Excludes hybrid variants. Sources include automaker and dealership information, Cars.com inventory analysis and the National Highway Traffic Safety Administration. Notice the European and Asian continents are well represented along with North America. The index features cars constructed then purchased in the states via corporations worldwide like the Toyota Corolla sedan and Mercedes-Benz GLE-Class SUV. 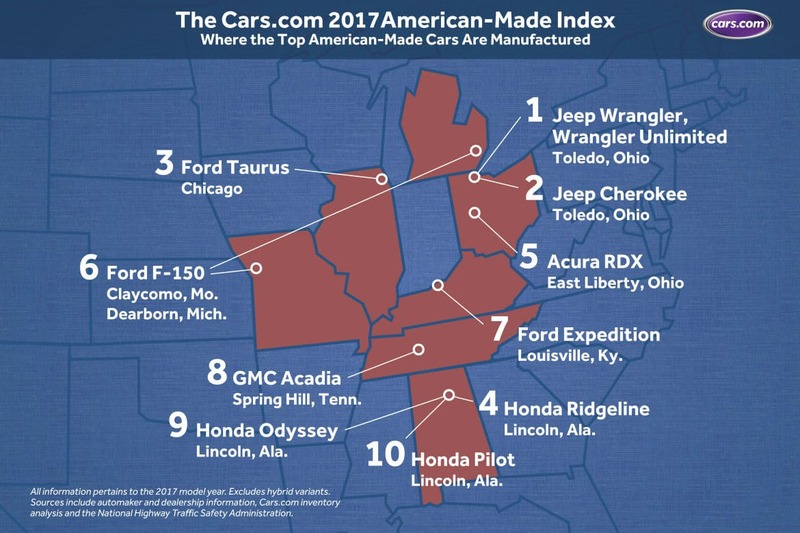 According to Senior Consumer Affairs Editor at CARS, Kelsey Mays, two Ohio-built SUVs from Fiat Chrysler Automobiles rose to the top of Cars.com’s 2017 American-Made Index: the Jeep Wrangler (including the Wrangler Unlimited four-door) and Jeep Cherokee. A major consideration these top models all had was the amount of domestic-parts content, among the highest concentration Cars.com tallied in this year’s AMI: 74 percent for the Wrangler, 75 percent for the Wrangler Unlimited and 70 percent for the Cherokee. All engines and nearly all transmissions for the Wrangler and Cherokee hail from the U.S. 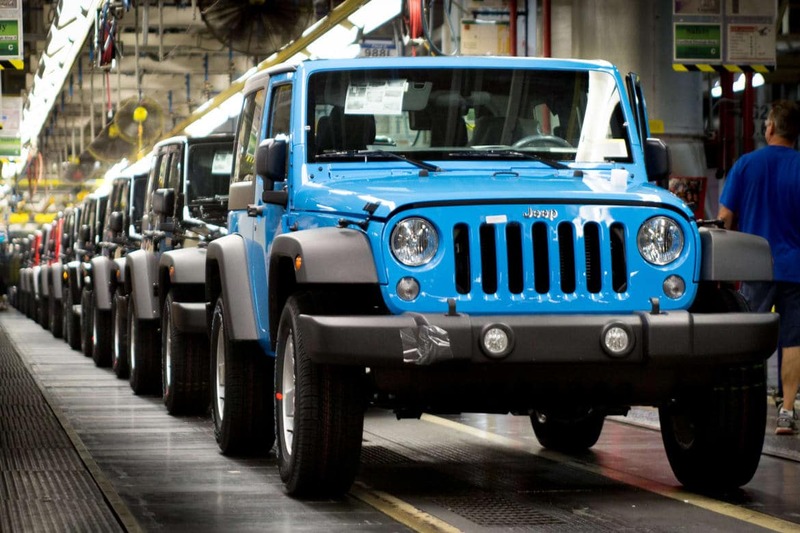 The Wrangler is assembled in Toledo, Ohio; the Cherokee also was built in Toledo until April 2017, when production moved to Belvidere, Ill.
Ford produced three AMI cars: the Chicago-built Taurus sedan, F-150 pickup truck (Michigan and Missouri) and Expedition SUV (Kentucky). GM’s redesigned Acadia, now assembled in nearby Tennessee, earned the eighth spot. Honda generated four AMI models: the Alabama-built Ridgeline pickup truck, Odyssey minivan and Pilot SUV, and the Ohio-built RDX SUV from its Acura luxury division. My cousin is a manager at a Ford plant in the state of Michigan. The Mother of my kid works as a Digital Solutions Manager, Dealer Groups for CDK Global. I am blogging about Cars.com as part of the associate program. Someone you know works in the car business. In 2015, CAR estimated that the auto industry attributed 7.25 million private-sector jobs resulting in $500 billion in compensation averaging out to $70,000 per worker. The numbers indicated 3.8 percent of all private-sector jobs where auto related and consistently makes up 3 percent to 3.5 percent of U.S. GDP. Now those employed directly at manufacturing plants totals around 322,000 fellow citizens says the Michigan-based Center for Automotive Research. Add in about 521,000 employed by auto suppliers while new car dealers employ 710,000 making the business as a whole a significant American job supplier. The scale breaks down this way, for every 20 people working in the U.S. auto industry, four work directly at manufactures while seven make their livelihood at suppliers, resulting in around nine employed at at new-car dealerships. You probably know someone that works for a used-car dealer, independent repair shop, finance banking or as insurance brokers. The bottom line is to remember to think big picture when purchasing an auto and factor in how buying a car employs a massive amount of Americans whether the manufacturer is headquartered in the states or not. The number one AMI 2017 vehicle is the Jeep Wrangler. Sports Techie, assembling cars is a fast-evolving business. Electric and driver-less cars are fast becoming what consumers are interested in purchasing because it helps the environment and has values the combustible engine and fossil fuels do not. In addition, robotics and automation will be a major source of job elimination in the near future. When that flip happens for good, investors and manufacturers are ready to pounce on the shift. This means the AMI will have to once again need to change their metrics as they did so this year. The Midwest is a fertile ground for auto manufacturers as well as votes along the political trail. I hope when the next Presidential election comes around, we are all wiser to the facts and less apt to be swayed by the king of ‘fake news’. Buying American is a fundamental right, caring about the world is a God-given responsibility that truly requires a global vision because we are all on this earth together with animals. Keep that top of mind next time you buy, sell or trade a car, seek service and repair, or look for reviews that factor in the big picture, not just campaign rhetoric.